Today Bungie announced a bunch of small balance tweaks for Destiny, a video game about warping through the solar system trying (yet again) to remember the last time you played Destiny. 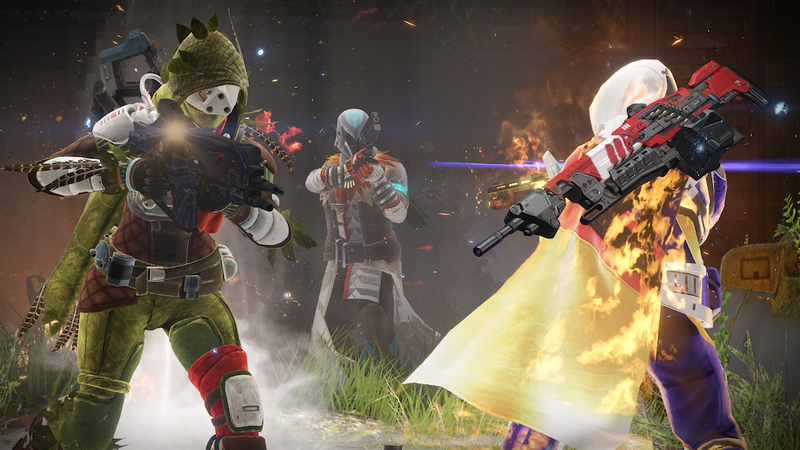 Next week’s big update will bring raise the light-level cap and bring some big changes to Destiny’s PvE Prison of Elders, and will add a lot of cool new gear you can try to get. Today, in their last livestream before the update goes live on the 12th, Bungie detailed some of the tweaks coming to PvP crucible matches. There’ll be a wide range of small buffs and nerfs; few of them sound very dramatic on their own, but together they should shake things up. Obviously these changes will affect PvE as well, but they’re designed more for PvP balance and shouldn’t have too huge an impact on PvE. Bungie will post a detailed breakdown of the numbers on their blog tomorrow, but here are some salient points I caught while watching their stream. Revives have gotten a significant nerf. They’ve tightened the range for a revive, slightly slowed down revive time, added a longer timer with subsequent deaths in a three-person match, and slightly nerfed the overshield you get for reviving or being revived. Special ammo will work differently: You’ll spawn with special ammo at the start of a match again, but the first special ammo crates won’t spawn in for three minutes. The second round of special will hit two minutes after that. There’ll be more legendary drops in crucible in general. Heavy ammo will only drop once per crucible match. This is a big change that I heard but didn’t jot down when I was taking notes for this post. Updated to add it! You’ll be able to repeat the “His Eye Upon You” Trials bounty every day Trials is active, which gets you a gold tier drop each time you turn it in. MIDA Multi-Tool: They say it’s by far the most popular gun compared with every other primary. To nerf it they’re removing high caliber rounds, the intrinsic property that staggers people you shoot. The gun should be the same, but getting shot by it won’t make your view jump as hard. SUROS Regime: Damage getting a slight buff, spinning up perk now kicks in about four shots later in the mag, focus fire gives you a good range boost. Hawkmoon: Increased the range, general accuracy of the gun is better. Man I hope this gun becomes good again. The Last Word: The Last Word perk does a tad less damage. Still a three-shot kill from the hip, no longer a two-shot kill. Thorn: Still a year one weapon. (Phew.) Minimized the DOT damage, each pulse does the minimum damage possible. Reduced duration of the pulse; it does four pulses instead of six, and poison visual is less intense on your screen. Ice Breaker: Still a year one weapon. When you switch away from Ice Breaker you lose the ammo you generated, so you can’t use it to fill your stocks and then switch to a better gun. Handling will come down, zoom distance goes out. Dreg’s Promise: Better tracking, mostly. Rounds will track enemies like a tracking rocket launcher. They showed this thing in action in crucible and it looks pretty nasty. Expect to get killed by this a lot after the update. Telesto: Telesto now recognizes friendlies. You can attach Telesto rounds to a friendly teammate and they’ll explode, but the explosion will only damage enemies. So, you could attach rounds to your friend as they charge into battle, which would turn them into a human bomb. Sounds excellent. Heavy weapons, sniper rifles and shotgun ammo carrying capacity will be reduced across the board. In PvE, you’ll get more special ammo drops to make up for that. Qullim’s Terminus: Reduced ammo inventory so it’ll allow for fewer ridiculous Crucible killing sprees. Aw. I loved camping a control point and killing like 12 dudes with a single heavy pickup. King’s Fall Guns: Global increase on reload speed. Anguish of Drystan gets a small stability increase. Sunsinger: They’ve lowered the amount of shield provided by the melee overshield and reduced the frequency with which you can get the shield. Other melee types are getting buffed slightly to encourage people to use them instead. (That will never happen.) Fireborn radience doesn’t last as long, so you’ll get a couple more grenades in your super if you don’t run Fireborn. Stormcaller: Reined in the Landfall ability—it won’t take down a Titan bubble anymore. They’ve also lowered some of the perks that extend the super, and using your lightning will drain your super faster than it did. Voidwalker: My stream cut out and I didn’t catch the particulars. Sorry! I gather they didn’t change much and actually buffed a few things. Firebolt grenades: Staying pretty much the same. Ha! Oh, well. That was everything I caught, though some of the particulars could be slightly off. I’ll update the post if that’s the case. Bungie will post a full breakdown of the rebalancing changes tomorrow, and presumably we’ll get more detail then. Nothing on this list leaps out at me as a massive buff or nerf, but it’ll be interesting to see how it all affects the meta come April 12. Guess it’s time to finally go get a Dreg’s Promise. Also, guess it’s about time to actually start playing Destiny again. I can’t tell whether I’m excited or scared.